Prince Edward Island is an unsung mecca for golfers of all skill levels. Anne's Land is the name given the central north-shore region of PEI, named after Anne of Green Gables. Its most popular location is Prince Edward National Park, home to the much visited Green Gables. Near the Park's entrance is Dalvay-By-The-Sea, the beautiful seaside resort used as the setting for The White Sands Hotel on The Road to Avonlea TV series and the TV movie. 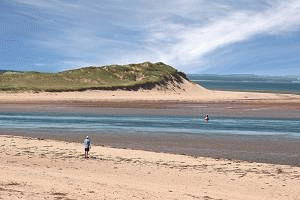 The Park also offers views of the Gulf of St. Lawrence, enjoyable sandy beaches, dunes, and inland hiking trails. The rolling farm landscapes, red cliffs and small towns of Anne's Land ring true to fans of L.M. Montgomery's book Anne of Green Gables. For a change of pace, stop in for some gouda and see how it's produced at Cheeselady's Gouda at Winsloe North. A lobster Fisheries Museum presents a traditional fishing village replica in North Rustico, an active fishing village today. The land's many eateries offer much fresh seafood, including lobster and mussels. Malpeque Bay is well known for its fresh oysters. Birdwatchers will delight in the many opportunities to see blue herons, ospreys and eagles. Several attractions offer adventure in the area, including Rainbow Valley with its ponds for canoes, pedal boats, and waterslides, and Sandspit for its racing cars, mini rides, mini golf, and bumper boats. The Toy Factory in New Glasgow sells handcrafted traditional wooden toys which can be personalized with a child's name. Ideally located on 25 acres, overlooking the scenic Prince Edward Island, this Mayfield, hotel is minutes from the world-famous Cavendish Beach and its many attractions. Green Gables house and museum and Ripley's Believe It or Not! Museum are also close to the hotel.